This page holds a space for us to practice mindfulness. Mindfulness of our connection to our breath, the cells within our body, to each other, and to our growing Mother Gaia Earth. This page stands as a JOYFUL reminder to lift our spirits and calm our minds while BEing awake and aware of our Ever-Living, Filling-ALL-Space, LIMITLESS Creator. I offer you the knowing of our interconnectedness with all things, from the infinitesimally small, to the unfathomable, vast, and ever-expanding Omnipresence. We Are All One. This one thought comfortably guarantees that we’re never alone, so there is nothing to fear – ever, and never a reason to feel lonely or depressed. In fact, how you feel in any given moment, depends solely on where you place your focus and attention. It’s that simple. Praying and meditating on the thought, “We exist to serve and enjoy LIMITLESS expansion”, will keep us free from sadness, competition, anger, guilt, or depression–because you simply can’t EVER get it wrong. When a perceived misstep occurs, learn, and move forward. Just keep swimming, or rather, keep flowing with what feels good. In that chapter, I explain how, in a very surreal yet practical way, I was given the knowing that We Are All Connected, as well as why it’s important. I was given to know how each of us can complete the circuit in our own body while understanding the importance of honoring our ancestors and connecting with others in our day-to-day lives. How we are to be open to receiving energy and information from others, even if we hold limiting beliefs or judgments about them. We are each changing in every moment, with EVERY interaction. It is our previous programming and biases (mostly stored in our subconscious) that keep us from connecting with others. When we let go of those biases and judgments (even a little bit), we can be amazed at what others have to share–and what commonalities we share. Connecting with others is so expansive! And so very healthy. Our human nature dictates and cause us to sense, the need to connect with another. We crave to be listened to–and understood. However, please note that no one can REALLY know everything about you. You’re way too complex and multi-faceted. And that’s okay! You’ve got so much going on, and you’ve lived so much life already, with all of your programmed thinking and experiences uniquely shaping your point of view. No other human being could fully understand what’s in your highest and best interest. And that’s okay, because to get the benefit of connecting with another, they don’t have to fully “get you.” As well, we’re simply not all on the same wavelength all the time, or even up to speed with each other on any given day; each of us learn at differing rates of speed, and some at deeper levels than others. It’s okay. You’re not reading this by accident. You are right where you’re supposed to be–and it’s good! If you don’t like where you are, you have the power to change. The choices you make for yourself ripple towards others, sometimes directly, other times indirectly, affecting others. We Are All Connected whether we are conscious of it or not. So, be kind to yourself, and to each other. Practice self love and self care. Be gentle with yourself. Be happy. Take it easy. Then, practice loving they neighbor with random acts of kindness, compassion, and forgiveness. 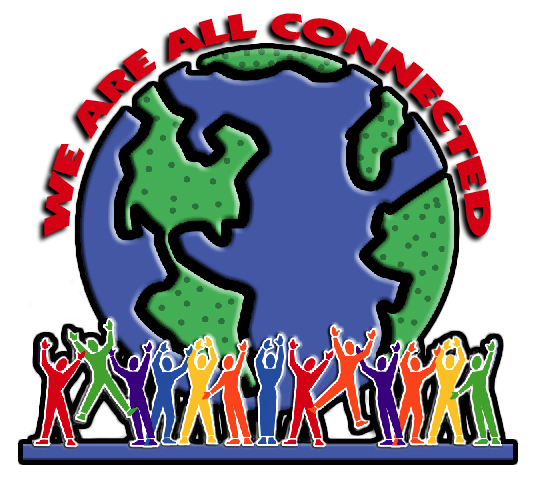 The phrase, “We Are All Connected” inspired the song “The connection”, performed by The Chevy Ford Band. Native Americans have long told of the phrase “we are all related.” And one of my favorite singer songwriters, Shelley Morningsong has written a beautiful song called, “Everything Is One Thing” on her “Full Circle” CD. Some may not believe we’re all connected, yet to me, it’s an undeniable reality. Movies, such as I Am, Avatar, Cloud Atlas, even Iron Man 3, promote the idea and knowing to the world of how we are all connected, and that everything IS connected. In the movie, Avatar, the natives connect with the animals they ride. The ground and plant life lights up as they step on the ground, or touch the plants. The tree of souls connects with the tribal people. All of the aspects of connection are so beautifully displayed in this movie. When you see the movie, look for these scenes and others that propel the message of connections. Why do we become upset? Maybe it’s not for the reason we think. When you are offended by another’s belief it is because you, yourSelf have given your power away and feel that tug-of-Spiritual-warfare, or need to CONTROL. Simply, allow Omniscience to control. For only Omniscience knows how the tapestry of the Universe is woven. If you find it difficult to forgive another, try forgiving yourself for that thought or action FIRST. Often another is in your life as your mirror. You’re aggravated at someone for something that you fear you might actually be thinking and want to control within yourself. Thus, when you hear something that upsets you, let the question, “What can I learn from this?” reverberate in your mind. And when you hear something you agree with, let joy and gratitude permeate through your whole being, right into your soul. Feel the eternal bliss from keeping your body at ease. People yell and scream at sporting events, when they should know the athletes cannot hear them individually (especially when someone’s at home, watching the sport on TV). All that yelling and screaming is background noise to athletes in a stadium. All of that cheering doesn’t make the football player run any faster, or hold onto the football any tighter–or does it? Maybe the yelling and rooting for your favorite player is because deep in our consciousness, we innately know it CAN affect the outcome! If so, that would mean there’s an unseen energy at work–right? We Are All Connected. Yes! I write about the myriad ways in which, We Are All Connected. There’s a reason we are all innately seeking these easy breezy feeling, genuine connections. When we feel connected, we feel good. When we feel disconnected, we don’t feel good. It is that simple, though our minds always want to make things complex. Assisting, serving, lifting up, lightening up, balancing, clearing, letting go, dancing in the love, energy flow!! Sheila intends to share what she’s learned of our connections and how they impact our health. She learns and shares her understanding of various healing and vital modalities too, in the hope that others may open their hearts and minds to new ways of thinking, in order to better care for themselves and others, with grace, ease, and unconditional LOVE. Your body is a temple. And church IS, wherever YOU are. She knows that’s where her “church” is. Remember the story about Jesus overthrowing the money changers’ tables in the temple! Do not allow any religion, doctrine, or dogma to control YOU! As in the game of tug-of-war, one side pulls the other off balance to win. It is always about control. They seem at odds with each other, but the rope connects them! Could a similar, yet unseen link occur among us through sound and light waves, frequency, vibration, or whatever “energetic pull” we have on each other within the invisible field of energy? Electricity exists even though we cannot see it. Be comforted in knowing there’s a lot going on in that seemingly empty space all around you. Be not afraid. Life is all around you and through you. And, you are never alone. To continue, check Sheila’s blog article (of the same title) that digs in and examines many of the specific Connections that have occurred in her life, visit: We Are All Connected. Return to Take It Upon Yourself.